Awhile ago, I was given the opportunity to try eMeals (read my review here) and really enjoyed the program. When I tried it, there were several options to choose from but now they have a new one that is perfect for summer since it won't heat up the kitchen - a slow cooking menu. eMeals.com, the leading online meal planner, has launched a new slow cooker meal plan to make your life even easier when it comes to getting meals on the table! 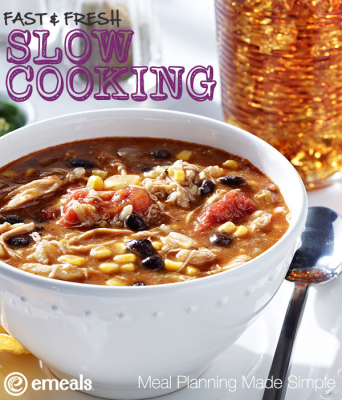 Each slow cooker plan will include 7 crockpot dinners, with some timesaving “cook once, eat twice” favorites. They have both a Slow Cooker Classic plan full of tasty comfort food as well a groundbreaking Slow Cooker Clean Eating Plan that serves up quick, simple, and healthy meals. Right now, you can use discount code LUNCHFREE for a free lunch meal plan with the purchase of a dinner plan. This is a fabulous way to get food on the table with the least amount of hassle possible. If you have given them a try before, please let us know about your experience.